During her long career Katherine Anne Porter wrote one holiday story. A beloved favorite among her fans, “A Christmas Story” first appeared in Mademoiselle in December 1946, and a decade later the magazine’s editors reinvented it as a limited-edition hardcover “Christmas card” to send to staff and associates. In 1967 Seymour Lawrence/Delacorte Press reprinted the tale, with drawings by Ben Shahn, as a small book for holiday gift-giving. 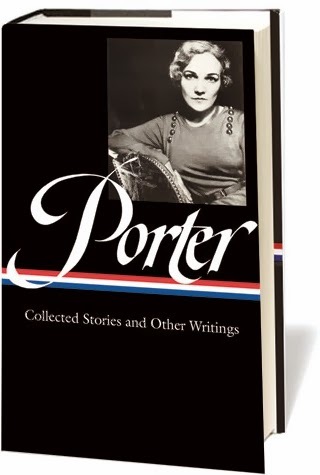 The piece was collected in The Collected Essays and Occasional Writings of Katherine Anne Porter (1970), but today it is available only in The Library of America edition of Porter’s writings—and now you can read it here, as a Story of the Week selection. The story recalls a day before Christmas 1918—the last time Porter spent with her young niece Mary Alice Halloway. Before embarking on a shopping trip, the aunt and her niece discussed (and dissected) various traditional Christmas legends: the fifteenth-century French song “The Miracle of St. Bertha, the Armless Servant, or The Three Days of the Virgin Mary,” popularized by Belle Époque cabaret singer Yvette Guilbert; a version of The Adoration of the Three Magi, illustrated by French painter Jean Fouquet, who used a likeness of Charles VII as one of the Magi; “The Cherry-Tree Carol,” based on a story about the infant Jesus from the apocryphal Gospel of Pseudo-Matthew; and “The Withy Tree” (better known as “The Bitter Withy”), a medieval English carol likewise based on stories found in the infancy gospels. This is not a fiction, but the true story of an episode in the short life of my niece, Mary Alice, a little girl who died nearly a half century ago, at the age of five and one-half years. The stories are those I told her, and those we sang together. The shopping for a present for her mother, my sister, in the last Christmas of this child’s life is set down here as clearly as I am able to tell it, with no premonitions of disaster, because we hadn’t any: life was daily and forever, for us both. I was young, too. This is, of course, a lament in the form of a joyous remembrance of that last day I spent with this most lovely, much loved being. . . . When she was five years old, my niece asked me again why we celebrated Christmas. . . . If you don't see the full selection below, click here (PDF) or click here (Google Docs) to read it—free! Thanks a million for Porter for Christmas! I am going to read this at my first chance, even if that means the morning after, & I know in advance it will sparkle with the physical pleasure that she was so gifted at conveying. Right in the heart, Katherine Anne, right in the heart.